It just clicked. And keeps clicking. He reads in bed, and he reads out the car window; “DO NOT PARK there Mom.” he informs even when I have no intention of parking. He reads as I type a text message; “But Mom?!? Why can’t we go to their house for cake?” He reads cards from his grandparents, and notes from the girls in aftercare who stuff them in his backpack when he isn’t looking. “Well Mom they can’t help it. They love me!” Readers read, and write back. He brings books in the car, on his own. He picked out a magazine at the grocery store. He wanted to read about the Royal Wedding, because one of his friends loves to talk about it. During independent time the other day (the time when I’m cleaning up after dinner, and making lunches etc. before we come back together for a game of some sort, fruit/desert like event and a story) he read the directions on how to fold a paper airplane out loud. (Directions, I still can’t follow apparently.) He reads the side of the pancake mix box, to figure out which ingredients we need. He knows which section of the score board is recording balls and which one is recording strikes at the baseball game. Watching his world expand like this is a source of immense pride, pleasure, and arrival for this (reading teacher) Mama. He knows how tickled I get hearing him read. He loves to see my jaw drop with awe. But like his first steps, and first words, it is another way in which he is naturally moving further into his own experience of the world and further away from mine. Readers need you a little less. Readers notice when other readers try to skip parts in books. Readers know that it says “Dad” and not “Uncle,” even though you insist you never read it differently. Readers can read what they want. Readers close the cover of a book they just read to their little brother in a very dramatic way while announcing that little brothers will just have to “wait until next time to see what happened to Luke Skywalker during his latest adventure.” And then they beam when their little bother make them promise to read more to them tomorrow. It was absolutely the coolest thing when the reading kicked in. Although I have to wonder when I missed all of the last six years. It is so amazing how each development milestone brings so much joy, and also some sadness as we watch them find more and more ways to move away from us. It is such an interesting feeling to hold both feelings simultaneously as I watch my babies grow and learn. There is nothing like being their momma. There is so much about parenting that I was in no way prepared for… on both sides of this equation. What a fabulous gift, the love of reading. Gift indeed. We are loving it. I bought Sam a new book to read for a plane ride coming up. And he’ll be thrilled. That is about as cool as it gets. Love for you two to have this to share with each other. Something you are both so easily drawn to, so easily proud of. I know there have been struggles, points of friction… this feels like a place to glide together in mutual appreciation. You are now both part of the same club. The reading club. The people who have access to the information that all the books say Mom and Dad and that you have the power to read them the just as they are written or to make them your own. 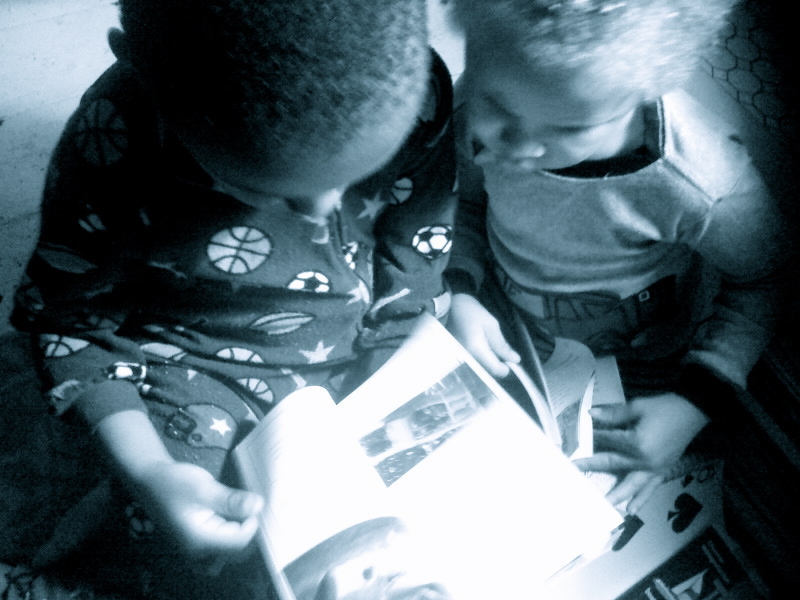 Love to you both… and to little brother who now has twice as much opportunity to be read to with love. That is one lucky boy. “glide together in mutual appreciation” sounds like the writer talking to me! Indeed. Baseball and reading are the glide points today! Tricks, skills and ah-has over here!